This project consisted of over 20,000 square feet of handset exterior Travertine cladding converging with glass skylights and large metal panel fins creating a saw tooth roof profile for the East and West elevations of the building. The intersecting and overlapping of these materials and trades created a unique construction coordination dilemma. 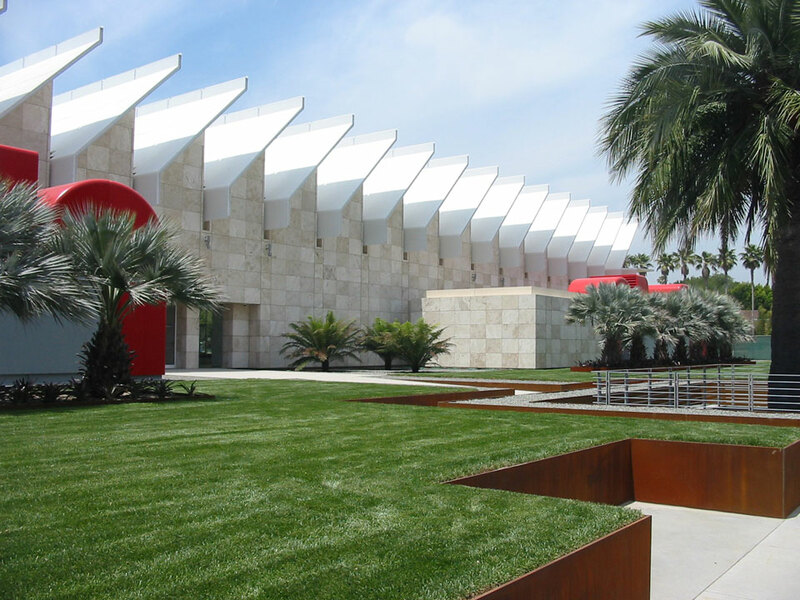 The goal was to achieve the coordination of structural steel, waterproofing, glazing, metal panels and stone merging in concert to arrive at the desired finished results within the construction schedule. With multiple trades involved in relatively tight areas and with even tighter tolerances, the Architect and the General Contractor developed 3D modeling to help provide understanding of the details and sequencing of the trades. With multiple coordination meetings to discuss the many intersections and angles where these materials all converged, the design of the flashing and waterproofing details started to evolve. Once the waterproofing details were completed and the trades sequenced, a field schedule was developed working the trades from South to North on the building utilizing tight time lines. The multiple trades involved worked in concert to complete this project on schedule. 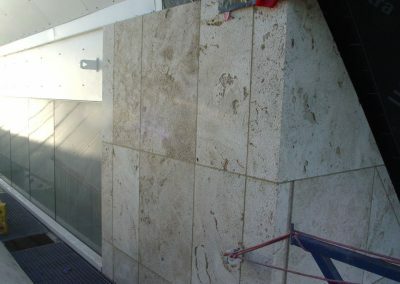 The selection of the Travertine was accomplished through a trip to Italy with Carnevale and Lohr, the Architect, the General Contractor and the Owners Representatives. First the quarry and bench were selected, blocks procured and slabs reviewed. Once the material was selected for range, the finish was reviewed and determined to be crosscut with a bush hammered finish that was then water blasted at high pressure to return the natural color to the stone and soften the texture. While this process was occurring, detailed shop drawing were being developed implementing the flashing and waterproofing details that were being developed in the coordination meetings. An involved stone numbering system was utilized so that each piece of stone had its own number relating to their specific location on the building. This allowed all of the nearly 5,000 pieces of stone to be drylayed in their proper location and approved for range and blend in Italy. They were then crated by priority following the detailed installation schedule for sequencing. This numbering system was then implemented in the field insuring each piece was installed in its correct location that matched the approved drylayed stone elevations in Italy. To achieve a cubic appearance for the 3 centimeter stone, all the corners and caps were cut, folded and glued with an exterior structural epoxy. These were carefully matched and then assembled in Carnevale and Lohr’s shop. The units at the bottom of each saw tooth were a compilation of four pieces creating a “U” shaped unit, all matched, cut, mitered and then assembled to appear as it was carved from a single block of stone. These 42 stone units also had to incorporate a sloped cap to allow for water runoff. The Architect’s design has 21 saw tooth sections, each on a ten foot module. These become the roof structure along with North facing skylights that allow indirect natural light into the exhibition space. There are 1 ½” wide by ½” deep vertical reveals carved in the stone that highlight and border each saw tooth. At the North and South elevations, there are exterior columns and returns that needed to appear as if they ran through the glass curtain wall to the interior. Alignment of the exterior and interior elements of the stone veneer at these areas was critical. Other unique Architectural elements are the stone clad outbuildings and the four large HVAC units with their return air ducting. In order to maximize the interior exhibition space for the building the Architect decided to have the HVAC units located at the exterior East and West elevations outside of the building framework. The duct work was then clad with fiberglass shells and painted Fire Engine Red to become an interesting element to the overall design. There are two outbuildings that are clad in stone that house the MEP equipment allowing more exhibition space on the interior. This project presented some unique design and engineering challenges to Carnevale and Lohr. 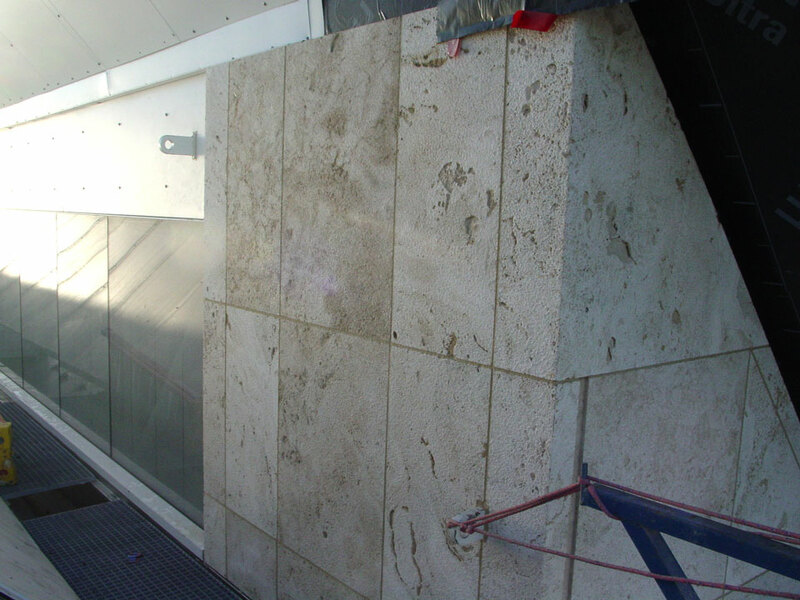 In order to create a dew point at the exterior of the building, which is paramount for Museums to help control the interior humidity, rigid insulation was required on the exterior side of the waterproofing membrane and a 1” airspace between the back of the stone and the rigid insulation needed to be maintained. In order to design a mechanically anchored system, Carnevale and Lohr developed and engineered a custom hat channel system that allowed for the rigid insulation to be mounted between the hat channels without interfering with the stone attachments. A weep system was also designed to allow for any moisture to escape this cavity.